Do You Need a Combustion Damper in Your Attic? Sometimes, making one decision means you have to make another decision. Like when you decide to order a pizza and then have to decide between pepperoni and mushrooms. Or when you decide to go to a coffee shop and then have to decide between a latte or a macchiato. Or when you insulate your attic with spray foam and have to decide how to provide combustion air to your furnace. That, too. And even when all those conditions are satisfied, a combustion damper isn’t the only solution. You can also install louvered grilles between the attic and the living space or just get a newer, safer, more efficient furnace (the best choice, as we’ll see). Your decision depends on your priorities – and your budget. First things first: Get a CO detector right now. Don’t even finish this article. Buy and install a carbon monoxide (CO) detector ASAP. If you’ve got an open combustion furnace in an attic sealed with spray foam, you could have a safety hazard on your hands. Without adequate ventilation (and spray foamed attics lack ventilation by design), there’s a chance that CO produced by your furnace will backdraft into your living space. That’s dangerous. Every hardware store carries CO detectors. However, given your attic/furnace arrangement, we recommend getting a “low level” CO detector that’s more sensitive than standard models. The best CO detectors will alert you when CO levels reach 10 parts per million (PPM). Most hardware store models only alert you when CO reaches concentrated volumes 40-50 PPM for 45 straight minutes. To be sure, any CO detector is better than no CO detector. But a low-level CO detector will always be the safer choice. A combustion damper allows air to pass from the outdoors to your attic whenever the furnace turns on. When installed correctly, the damper provides the right amount of air for the combustion process. It lets the furnace work properly without increasing the risk of CO backdrafting. The damper stays closed most of the time. It only opens when your furnace needs air for combustion. Since any roofline penetration holds the potential for problems, a sidewall or soffit installation is preferred. Some HVAC companies don’t install them properly, so your CO backdrafting risk is only marginally reduced. It creates a breach in the spray foam job, potentially increasing air infiltration. Since the damper stays closed, it’s a small breach. But a breach is a breach. If you’re set on keeping your open combustion furnace after insulating your attic with spray foam, you might prefer this option to a combustion damper. Instead of breaching the spray foam work with a damper to the outdoors, it’s possible to install one or more louvered grilles between your attic and your living space. When you go this route, you’re allowing the furnace to take air from your home and use it for combustion. It’s like increasing air leakage to your attic, except there isn’t an energy penalty since you’ve insulated the attic with spray foam. In a tightly sealed environment, there might not be enough indoor air for proper combustion. You might find them unsightly. This is always the best choice. Compared to installing a damper or grilles, it’s definitely more expensive to replace your open combustion furnace with a high efficiency, sealed combustion model. But in the long run, it’s worth it. A sealed combustion furnace drastically reduces the risk of CO backdrafting while avoiding the negative consequences of dampers or grilles. When possible – and if you’re in a position to plan ahead – you should always budget for a sealed combustion furnace as part of a spray foam insulation upgrade. Every sealed combustion furnace contains a dedicated pipe just for combustion air, so it doesn’t matter if the furnace is in a confined space or not. Assuming it’s properly installed, the furnace pulls combustion air directly from the outdoors by design. 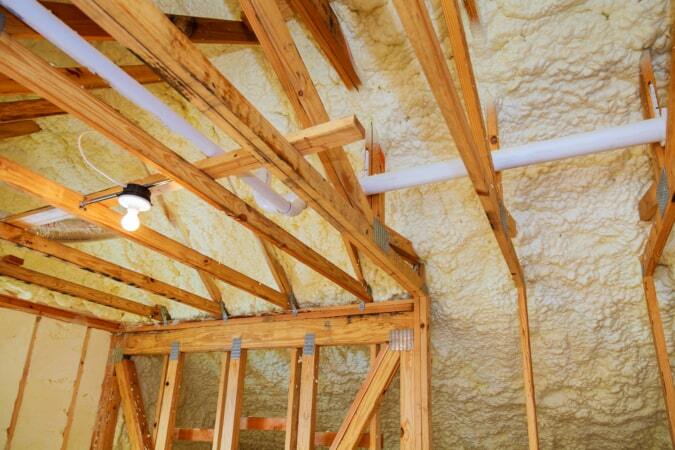 When it comes to spray foam, be aware of the implications. Any major energy efficiency upgrade has the potential to impact the safety, efficiency, and operational integrity of your existing HVAC system. That doesn’t mean you shouldn’t pursue the upgrade. It just means you should understand the consequences at the outset. In the absence of a combustion air pathway, spray foamed attics and open combustion, 80% AFUE furnaces aren’t always compatible. It’s a problem, but it’s a problem you can address without a lot of trouble. Just remember to get that low-level CO detector, no matter what kind of furnace you have.